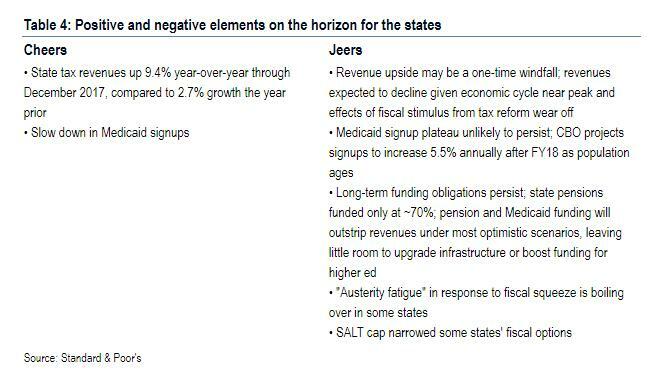 In the aftermath of Trump's tax reform, which many mostly coastal states complained would cripple state income tax receipts and hurt property prices, S&P offered some good news: in a May 30 report, the rating agency said that "[s]tate policymakers have a lot to cheer," noting the current slowdown in Medicaid signups and dramatically higher revenue collections, to the tune of 9.4%, are significantly boosting state fiscal positions. Still, the agency's view is that current conditions are "most likely only a temporary respite" (very much the same as what is going on at the federal level) means that the agency is likely to focus on "a state's financial management and budgetary performance during these 'good' times" to determine its "resilience to stress when the economy eventually softens" according to BofA. "[f]or those [states] that either stumble into political dysfunction or - out of expedience - assume recent trends will persist, this moment of fiscal quiescence could prove to be a mirage." This is gpod news for states that had expected a sharp decline in receipts, and is especially important for states heavily skewed to the personal income tax since revenue from that source should rise by over 14%, according to BofA calculations. Finally, the BofA chart below is useful for two reasons, first, it shows the states most reliant on individual income taxes from the Census Bureau's most recent annual survey of tax statistics. Oregon - at 69.4% of total tax collections - is most reliant on individual income taxes, followed by Virginia (57.7%), New York (57.2%), Massachusetts (52.9%) and California (52.0%). More notably, it shows the full relative breakdown of how states collect revenues, from the Individual income tax-free states such as Florida, Texas, Washington, Tennessee, and Nevada, to the sales tax-free Alaska, Vermont and Oregon, to the severance-tax heavy Wyoming, North Dakota and Alaska, and everyone inbetween: this is how America's states fund themselves.